In Flanders Fields, the poem written by Canadian army doctor John McCrae (1872-1918) in 1915, is the most iconic text about the tragedy of the First World War, and it has been set to music many times. McCrae, who volunteered as an army doctor in the First Brigade of the Canadian Field Artillery, was confronted daily with the horrors of war at the medical station in Boezinge (near Ypres). He wrote various war poems, but he penned these gripping verses on 3 May 1915, the day after his friend, lieutenant Alexis Helmer, was killed by shellfire. It was during this Second Battle of Ypres that the Germans used chlorine gas for the first time. The continuing popularity of In Flanders Fields can be explained by its direct and clear use of language and by its engaging symbolism: the poppies and the lark in contrast to the violence of the war. The poppy is the international symbol for the victims of the First World War, but it also stands for the power, the will to survive and the beauty that can rise even from blasted and bombed battlefields. Poppies are pioneer plants that germinate and flourish even in places where everything has died and nothing can grow anymore. On top of that, the bright red colour and the fragile leaves recall the blood of the perished soldiers. The flower had already been used as a symbol for war in 1878 by Pol De Mont in his poem Kollebloemen (an archaic word for poppies), in which the flowers predict the acts of war. 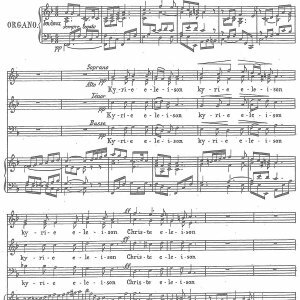 The poem by De Mont was set to music in 1879 by Edgar Tinel (Repertoire Explorer, The Flemish Music Collection, no. 572). McCrae wrote his verses from the point of view of the victims who died in the Flemish fields. He is one with them: ‘We are the Dead. Short days ago / We lived, felt dawn, saw sunset glow, / Loved, and were loved, and now we lie / In Flanders fields.’ He mourns the dead, however, In Flanders Fields is not a pacifistic text. McCrae issues a clear call to arms, to continue the battle of the fallen: ‘Take up our quarrel with the foe.’ Only when the enemy is conquered, the perished soldiers will be at peace and they will not have died in vain. The poem was published on 8 December 1915 in the English magazine Punch and it immediately became highly popular. The text was printed on posters and taught in schools. It didn’t take long for composers to write music for McCrae’s text, which furthered its international distribution. One of the earliest compositions is the song published by J. Deane Wells in 1917 in Vancouver. Other early versions are those by John Philip Sousa, Frank E. Tours and W.H. Leib, all from 1918, and the one by Charles Ives from 1921. Since then, the verses have been set to music by dozens of composers, as a song or a choir piece. John McCrae would not live to see the popularity of his poem. In 1917, he started to suffer from respiratory problems, more than likely because of the chlorine gas he inhaled. At the beginning of 1918, he contracts severe pneumonia and passes away on 28 January 1918, barely 46 years old. 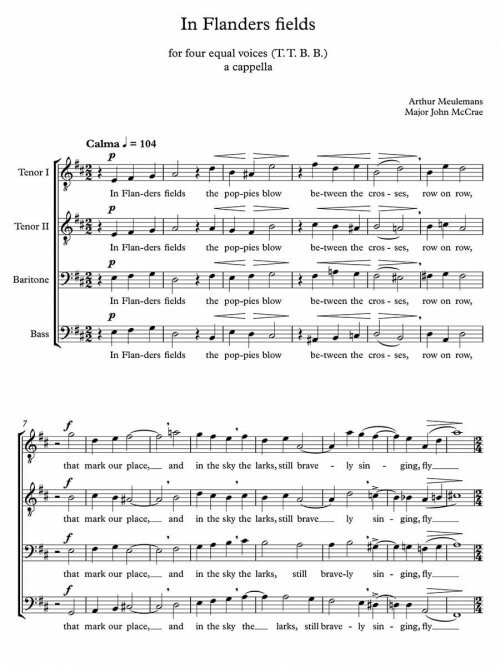 It is not clear what prompted Arthur Meulemans to write his version for a four-part male choir on 1 May 1960. The work is only handed down as an autograph manuscript and there are no signs of a possible performance. What is striking is Meulemans’s use of a martial passage and a repetitive and emphatic E in the second tenors and the basses as a way to highlight McCrae’s call to continue the battle. This new edition was edited by Toshiyuki Shibata and published in cooperation with the Studiecentrum voor Vlaamse Muziek (Centre for the Study of Flemish Music – www.svm.be).